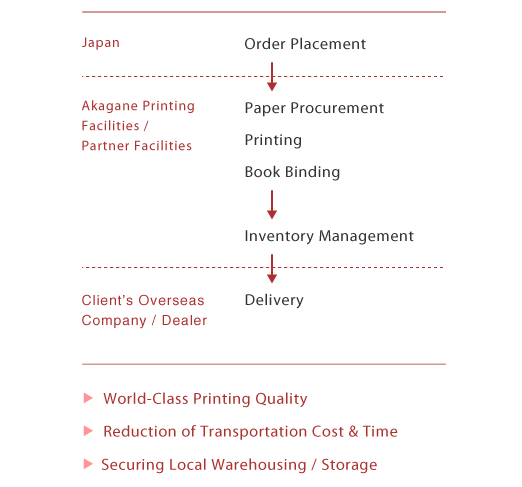 Order Printing & Shipping from Overseas | Akagane Inc. Client D, a manufacturer of industrial components, wanted to have product catalogs to be printed in Japan. However, due to the high printing costs in Japan as well as the transportation costs and time from Japan to Thailand, they had no choice but search for a reliable business partner who has an established presence in the Thai market. – Also increased operational efficiency by eliminating the need for warehousing and shipping at the client’s site. Through stakeholder interviews and data collection, Akagane obtains a good understanding of a client’s objectives and requirements as well as key business information such as catalog specifications and ship-to locations. Based on the analyses of such information, we make a proposal including the optimal production facility which meets all elements of the QCD (Quality, Cost, Delivery) model. Akagane ensures that the production facilities owned by Akagane as well as its partner companies produce high quality products which exceed the quality standard established by Akagane’s Quality Assurance Team by conducting thorough quality inspections. The products and services rendered by our own facility in China and also our partner facilities in South Korea, Thailand, Singapore, Vietnam, and Indonesia have received high recognition from clients around the world. Many of our clients’ overseas subsidiaries do not have warehousing available for local sales material storage. 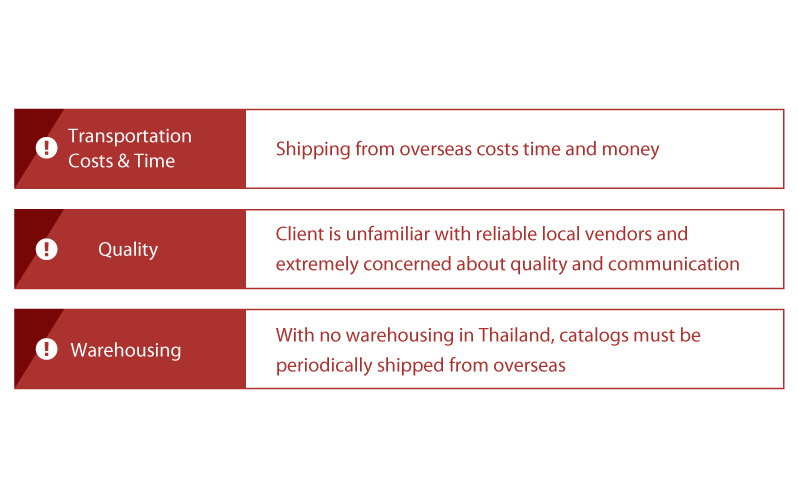 Akagane offers third party logistics service in East Asia and South Asia regions by storing and managing the inventory, and shipping the products per order for the specified quantity and to the designated location. Effectively utilizing our expertise, logistics know-how, and experience specific to each overseas market, Akagane’s 3PL services strive to assist our clients in further increasing competitiveness by focusing on its core competency while improving its operations costs and level of service.